Joni is based in the San Francisco Bay Area of California and is known for her piano driven ballads. 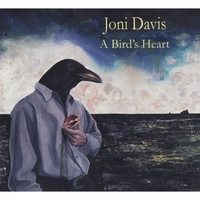 A Bird\'s Heart is her second self-released album. Most of the tracks on the album were recorded over a two-week period in the fall of 2006. Additional strings and saw, written and performed by Quinta, were recorded while Joni was in London during Spring/Summer 2007. In her songwriting Joni explores the challenges of being uncomfortably human, and uses piano, guitar, accordion and subtle electronics as a sonic backdrop to her lyrics. Musical influences include Kate Bush, Bill Callahan, Maria Callas, Nick Cave, Chopin, PJ Harvey, Laura Nyro, Will Oldham, Nina Simone, Sparklehorse, the Tindersticks and Tom Waits. \"With her resonant, powerful voice, Joni weaves astonishingly direct and affecting tales full of melancholy, reparation and the transience of the human condition. The immaculate production, by Joni and her husband, at times gives the feeling of having her singing only for you in the very same room. A brilliant performance of unsettling, incredible, positively sepulchral songs, A Bird\'s Heart simply begs for wider recognition.\"
Wears the Trousers, Alan Pedder, 16 July 2008.